Heat a dash of oil In a heavy-based frying-pan and brown mince over high heat. Reduce heat and simmer for 10 minutes until the mince is cooked. 1. Preheat the oven to 180°C and grease a large oven proof dish. 2. Spread a layer of tortilla chips along the bottom of the dish. 4. Spoon some All Gold Chilli & Herbs Mexican Style Chopped Tomatoes over the tortilla chips and browned mince. 5. Add some chopped chilli, spring onion, chopped onion, sour cream and a handful of grated cheese. 6. 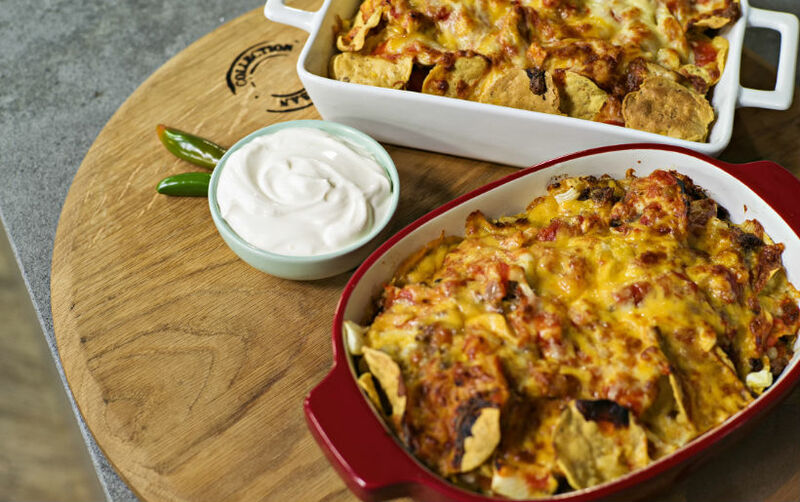 Continue to layer the ingredients in this way, ending with a layer of tortilla chips covered in grated cheese, sour cream and a sprinkling of chopped chilli and spring onion. 7. Bake in the oven until the cheese is melted and bubbling. 8. Serve with a side of guacamole and sour cream. Tip: If you want to give the nachos more of a kick, drizzle some All Gold Hot & Spicy Tomato Sauce!